If you have upgraded to iOS 9.1 by accident and that iOS 9.1 is yet to be jailbroken, the only choice left is to downgrade iOS 9.1 to 9.0.2. If you have recently upgraded to iOS 9.1 by accident only to know that iOS 9.1 is yet to be jailbroken, the only choice left is to downgrade iOS 9.1 to iOS 9.0.2 and re-jailbreak your iOS 9.0.2 since it’s is currently the latest jailbreak-able iOS version. Note: The downgrade would still be possible if and only if Apple is still signing for iOS 9.0.2 at the date you are reading this guide. If Apple stopped signing iOS 9.0.2, like all the previous iOS versions, downgrading to iOS 9.0.2 will no longer be possible. Please scroll to last paragraph for updates on Apple iOS 9.0.2 signing status. Since iOS 9.1 was released a while ago, many have been trying to update to it without knowing that none of the jailbreak tool is able to jailbreak iOS 9.1 yet. Well, if you rely on jailbreak for your device, the current latest jailbreak-able iOS version is iOS 9.0.2. If you have updated to iOS 9.1 just because you are curious about it or that you have misclick the Update now button from the software update pop-up on your device, the best chance is to downgrade your device from the current iOS 9.1 to iOS 8.4 or iOS 9.0.2, and jailbreak iOS 9.0.2. First, you will have to download and install the latest iTunes for PC or Mac. This is important because for iTunes to recognize the iOS 9.0.2 IPSW file, you will need the latest version of it. 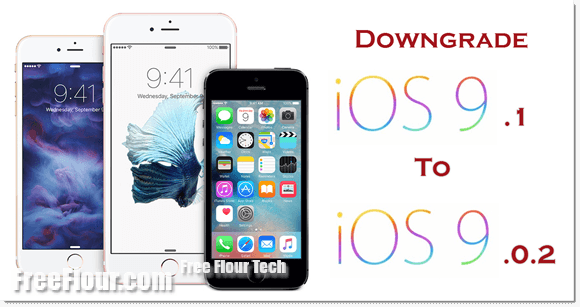 Then, download iOS 9.0.2 IPSW for iPhone, iPad, or iPod touch that match your device model. When you have everything mentioned above prepared, begin by first backing-up your data. There is a little problem here when we do a backup for iOS 9.1 because iOS 9.1 backup will not be backward compatible with any older version of iOS. That said if you have a iOS 9.1 backup file, it will not be usable on a device with iOS 9.0.2. The best method to backup in this situation is by syncing your photos, videos, apps and everything else to your iTunes or iCloud manually. When the downgrade is done, simply sync your data back to your device. When your backup syncing is done, you will need to disable several iOS features that would interrupt the downgrade if left on. First, disable “Touch ID & Passcode” by going to Settings app on your device, and then to Touch ID & Passcode. Tap on the “Turn Passcode Off” to turn it off. Next, disable “Find My iPhone”. Go back to Settings, then to iCloud, Find My iPhone. Swipe the left right button to turn off Find My iPhone feature. So, assuming that you have done everything listed above, you can now begin the iOS 9.1 to iOS 9.0.2 downgrade process. First, connect your iPhone, iPad or iPod Touch to your PC or Mac and then launch iTunes. When iTunes is launched and your device is detected, on the left panel you should be able to see your device model and name. Click on the Summary tab below it. From the right window, you should see your device storage capacity, your device phone number, serial number and the current iOS version. Do not hit Update as it will update you to the latest iOS version available. To downgrade to iOS 9.0.2, hold Shift and left click on the Restore iPhone button if you are using a PC or hold ALT and left click if you are on a Mac. A window will then pop up which you need to navigate to your iOS 9.0.2 IPSW file matching your device model you have downloaded earlier. When the IPSW file is selected, the restoring process will start automatically. From now on, it’s just about waiting. If iTunes shows you an error (especially iTunes error 3194), it most likely indicates that Apple has stopped signing for iOS 9.0.2 and thus the downgrading is no longer possible. Edit: (26 Nov) Apple has officially stopped signing for iOS 9.0.2. Downgrading to iOS 9.0.2 is no longer possible. However, if you are really very desperate to jailbreak your device, you can still downgrade to the ancient old iOS version such as iOS 5 or iOS 6 if you have their baseband saved on your local computer or Cydia. Well, if you have upgraded to iOS 9.1 by accident, the best chance now is to wait for iOS 9.1 to be jailbroken. It will soon be available since it’s been nearly a month now that the developers have been working on it. We will get back to you and keep you updated as soon as iOS 9.1 jailbreak is available for your device. Follow us on Facebook or twitter to be informed whenever a new iOS jailbreak is released. Simply click on the like button beside my name below to follow us on Facebook.